Since taking office, New York State Comptroller Thomas P. DiNapoli has battled public corruption. One of his top priorities is to protect the New York State and Local Retirement System (NYSLRS) from pension scammers. Under the direction of Comptroller DiNapoli, NYSLRS has put in place a system of safeguards designed to prevent and identify potential incidents of pension fraud. One such safeguard uses data analytics to uncover and stop improper payments. Our investigative efforts include a focus on post-retirement employment. New York State law restricts the amount of money public sector retirees can earn if they return to public service employment after retirement. The law permits public sector retirees under the age of 65 to earn up to $30,000 per year from public employment before their pension benefits are suspended. As of this March, our review of post-retirement employment cases have uncovered more than $700,000 in benefit payments subject to recovery. For example, a former Newburgh City Fire Chief, who double-dipped by collecting $95,000 in pension payments while still working as fire chief, was federally convicted. In some cases, the pension fraud NYSLRS uncovers gets referred to Comptroller DiNapoli’s wider umbrella program to root out public corruption and fraud involving public funds. The Comptroller’s aggressive initiative included partnering with federal, state and local prosecutors and law enforcement statewide, including DiNapoli’s groundbreaking “Operation Integrity” task force with Attorney General Schneiderman. To date, Comptroller DiNapoli’s various partnerships have garnered more than 130 arrests and $30 million in ordered recoveries. NYSLRS’ partnership with DiNapoli’s “Operation Integrity” has resulted in the investigation, prosecution and recovery of stolen pension payments, exposing $2.75 million in pension fraud in recent years. A 71-year-old Florida man was convicted of grand larceny after it was discovered he stole $180,000 in NYSLRS pension benefits by impersonating his dead brother. A 67-year-old South Carolina man concocted a scheme to steal a deceased New York State employee’s pension checks. He was arrested for conspiracy to commit wire fraud, which carries a maximum sentence of 20 years in prison. A 66-year-old Arizona man was convicted of grand larceny for stealing his late mother’s pension. He was sentenced to five years probation and ordered to pay back over $131,000. A 70-year-old Florida man was sentenced to five months in jail for stealing nearly $275,000 in pension benefits. Comptroller DiNapoli and NYSLRS will not tolerate pension fraud. These arrests and convictions serve as warnings to those who might steal pension benefits: if you think you can steal the hard-earned benefits of NYSLRS members and retirees, you are gravely mistaken. When fraud is identified, Comptroller DiNapoli will work with law enforcement to hold the pension scammers accountable. The clear message to anyone who tries to defraud our pension system is that you will be found, and you will pay. 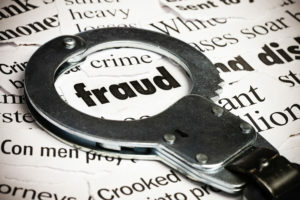 If you suspect someone of pension fraud, call the Comptroller’s toll-free Fraud Hotline at 1-888-672-4555, file a complaint online at investigations@osc.state.ny.us, or mail a complaint to: Office of the State Comptroller, Division of Investigations, 14th Floor, 110 State St., Albany, NY 12236. Content last revised November 17, 2016. This entry was posted in General News, Pension System and tagged Comptroller Thomas P. DiNapoli, ERS, Fighting Pension Fraud, fraud, Information is the Key, integrity, members, New York State & Local Retirement System, New York State Common Retirement Fund, NYSLRS, One of America's Largest Pension Systems, Operation Integrity, pension scammers, Pension System, PFRS, Post-Retirement Employment Violations, public pension system, retirement security, safeguards, Stopping Fraud, Strength Through Strategy, this public pension system works on November 17, 2016 by NYSLRS. Public pensions play an important role in our state’s economic health. The pensions NYSLRS retirees earn flow back into their communities in the form of property and sales tax payments, and local purchases. When public retirees stay in New York, they help stimulate and grow local economies. As of March 31, 2016, there are 440,943 NYSLRS retirees and beneficiaries. Seventy-eight percent of them – 345,643 – continue to live in New York. Suffolk County is home to the largest number of NYSLRS retirees and beneficiaries. More than $1 billion in pension benefits went to the 33,290 individuals who live there. Erie County has the second largest number of benefit recipients (29,029), who received $701.5 million. NYSLRS retirees are patrons of local business and services, and they pay state and local taxes. By spending their retirement income locally, they help fuel the economic engines of their communities. In fact, a study by the National Institute for Retirement Security (NIRS) found that state and local pensions in New York State supported 215,867 jobs, driving $35.3 billion in total economic output and $8.1 billion in federal, state, and local tax revenues. New York mirrored the NIRS report’s results across the rest of America. Nationally, retiree spending of pension benefits in 2014 generated $1.2 trillion in total economic output, supporting some 7.1 million jobs across the U.S. The NIRS report suggests that a stable and secure pension benefit that won’t run out enables retirees to pay for their basic needs like housing, food, medicine and clothing. It’s good for the economy when retirees are self-sufficient and regularly spend their pension income. They spend that money on goods and services in the local community. They purchase food, clothing, and medicine at local stores, pay housing costs, and may even make larger purchases like computer equipment or a car. These purchases combine to create a steady economic ripple effect. Retirees with inadequate 401(k) savings who might be fearful of running out of savings tend to hold back on spending. This reduced spending stunts economic growth, which already is predicted to drop by one-third as the U.S. population ages. 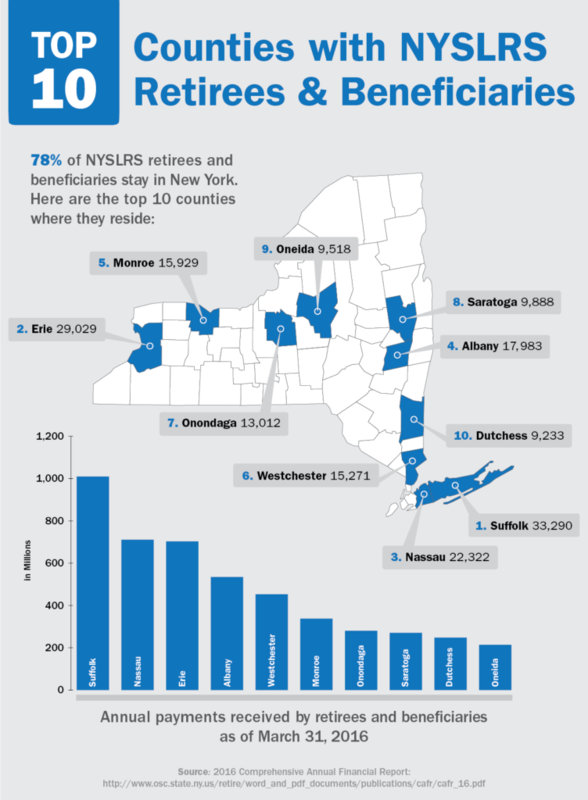 NYSLRS retirees live throughout the different regions of New York, but they only make up 2.9 percent of the general population. In some cases, they pay a larger share of property taxes. For instance, in the Capital District, retirees make up 5 percent of the population yet they pay 8.7 percent of the property taxes, which totals $218 million. In the North Country, retirees make up 4.3 percent of the population and pay 6.8 percent of the property taxes ($55 million). After a career in public service, NYSLRS retirees continue to contribute to their communities and the State. Their pensions are a sound investment in New York’s future. Public pensions don’t just benefit those who receive them, but they pay dividends to local businesses, support local communities, and create jobs. As the number of NYSLRS retirees grows, it’s likely they will continue to help build a strong New York. This entry was posted in General News, Retirees and tagged Economic Impact of Retirees, ERS, Information is the Key, New York State & Local Retirement System, New York State Common Retirement Fund, NIRS, NYSLRS, NYSLRS Retirees, PFRS, Public Pensions, Retirees Contribute, Retirees Create Jobs, retirees pay taxes, retirement, Strong New York, this public pension system works on November 2, 2016 by NYSLRS.